A theater in Kyiv provoked protest Tuesday from the local Jewish community after displaying a sign above its entrance proclaiming the title of an upcoming play, "The Trials of John Demjanjuk: A Holocaust Cabaret," according to The Times of Israel, a Jerusalem-based online newspaper. The sign was put up a day earlier, while Israel was marking Holocaust Remembrance Day, and drew criticism from the chief rabbi of Ukraine, Moshe Azman, who posted pictures of the theater on his Facebook page, The Times of Israel reported. 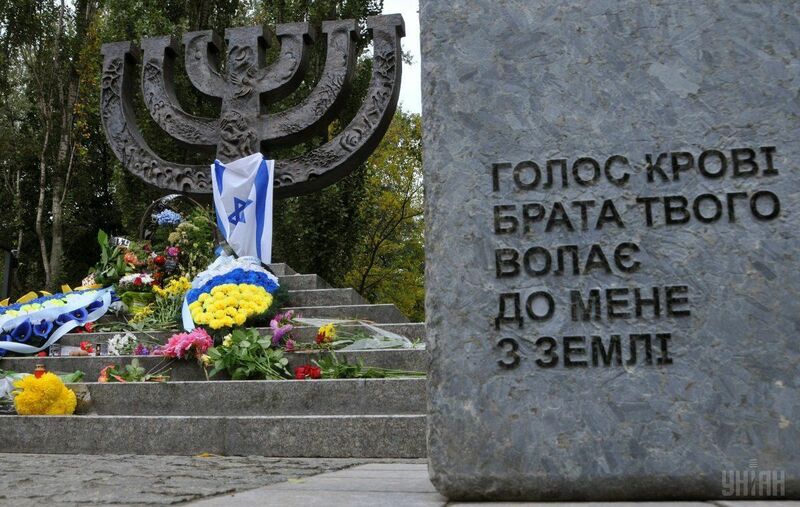 "This horror (I cannot find another way to describe it) was hung in the center of Kyiv yesterday, on Holocaust Remembrance Day, in the city where Babi Yar (Babyn Yar) is located, opposite the central synagogue!" he wrote, referring to the Nazi execution by firing squads of nearly 34,000 Jews in a Kyiv ravine, on September 29-30, 1941. Read alsoUkraine marks Holocaust Remembrance DayThe play, written by Jewish Canadian playwright Jonathan Garfinkel in 2005 and later updated, is a satirical look at the trials of John Demjanjuk, a former guard at the Sobibor extermination camp in Poland during World War II. Demjanjuk, who moved to the US after the war, was tried in both Israel and Germany for his alleged activities. "And tickets for the Friday performance are sold," Azman continued. "I do not know who needs this provocation, but I declare that we, the Jewish community, will do everything to remove this provocation immediately!" Azman urged people to protest against the sign, and three hours later posted further pictures showing it being taken down. "Thanks to all non-indifferent people and state structures for an instant reaction," he wrote, "the sign was dismantled." The Hebrew-language Ynet website reported that Ukrainian authorities were considering canceling the show, which was scheduled to begin performances at the end of the month. Russian-born Yesh Atid MK Yoel Razvozov said he intended to contact Ukraine's Jewish prime minister, Volodymyr Groysman, and request that the show be canceled. "It is a provocation," he said. "After seeing excerpts from the play there is no question that this is an anti-Semitic show, even if it is supposed to be satire." In 2011, Demjanjuk, a former Ohio autoworker, became the first person convicted in Germany solely for serving as a death camp guard, with no evidence of involvement in a specific killing. Demjanjuk always denied serving at the Sobibor camp and died before his appeal could be heard. In an email to The Times of Israel Tuesday, Garfinkel apologized for the "glibness" of the video, while asserting that there was nothing anti-Semitic about the play. "I understand the discomfort and sensitivity in Ukraine around the Demjanjuk trial, and specifically the precarious situation of the Jewish community and its history in Kyiv, especially with Babi Yar," he said, noting that "the play is not only a satire, but it is about the complexity of memory and the nature of war crimes trials." Garfinkel said the play's attempt to humanize Demjanjuk was "merely a way to give specificity to the actions done during the Holocaust by perpetrators; they were done by real people from real places with real lives." The subtitle "Holocaust Cabaret," he continued, was not meant as a provocation, "but rather as a means to illustrate the idea that a public trial has an element of theater to it."